Finally! We are moving to a big(ger) apartment! I can't tell you how happy and relieved I am. For the last 2 years my tiny 40m2 apartment was a prison for me. Some of you might laugh, but in fact 40m2 is a pretty small place for 2 adults, 2 sewing machines and 1 overlock. To give you an idea what the sewing has been to me in the past, here is our living room which was also a sewing room, laundry room (you can't actually see the laundry, it's behind the sewing machine on the left), study and dining room. Trying to cut silk organza for my skirt. Sewing in such conditions has been quite a challenge. I was lucky enough to use the ESMOD classroom before or after the class and cut the fabric for my personal projects. But during holidays, which are ending this weekend, it's been a nightmare. 4-5 hours of laying out the fabric on and cutting it on the floor would give me a 5-6 days back and neck pain. "Bloody hell!" I said few days ago, waking up with the most horrible pain. I have stopped sewing until I move to a better place. SOOOOOOOOOOOONNNNNNNN.. It's all happening next weekend (in 8 days) and guess what? I am entitled to a sewing room! Just for myself and nobody else! All excited for the new room and dreaming how to equip it, I've ordered this adjustable body form from Amazon. I think it's the best of all the adjustable forms that I could find on the internet. Many people complain that the body is pretty light (almost 5kg) and wobbly. But at the moment being mentally prepared for this, I am quite OK. 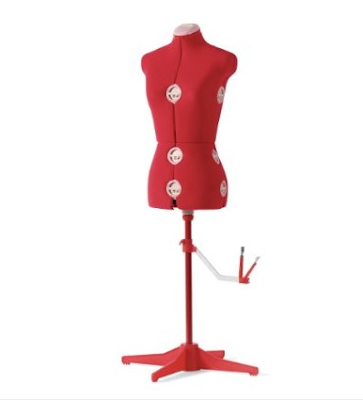 When I start feeling like I am Coco Chanel, I might order the custom-made mannequin, but for the time being this perfectly matches my needs. Do you own a similar body form? What's your experience of it?